"I wonder where this goes to ?" On Sunday morning, Mr Rik phoned the Helicopter Company to arrange a flight over Toronto. 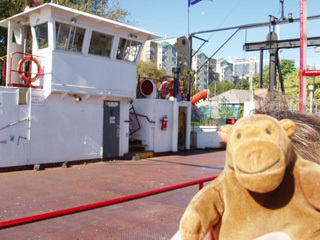 After a quick taxi ride, Mr Monkey found himself on the ferry from the bottom of Bathurst Street, heading towards Toronto City Airport. 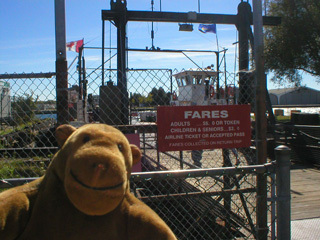 This ferry ride took all of five minutes, if that. You can read about the airport at the Toronto City Airport website.